8% to 12% Hard Money For Fix and Retail Real Estate in Richmond VA is here. Richmond REIA Holiday Party!!! and Networking Event.... Setup your 2015 NOW !!! 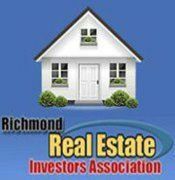 This is the official information page for the Richmond Real Estate Investors Association (RREIA, Inc). Members may network with one another via our Facebook group page https://www.facebook.com/RichmondREIA or by going to http://www.RichmondREIA.COM. You must pay dues to join the Association and the options for the Dues are listed at http://www.RichmondREIA.COM and there you will find your options for a month to month, yearly discounted membership for individuals, couples and or business partners. Guests event fees are $10 in advance / $15 at the door per person per meeting. Members may post deals in the Deal Maker Section of the main page http://www.RichmondREIA.Com site.